If you are thinking about purchasing a copper pet bowl then you have certainly come to the right place. After all, your pet is a member of the family and you need to do everything that you can to make sure that they have what they need. 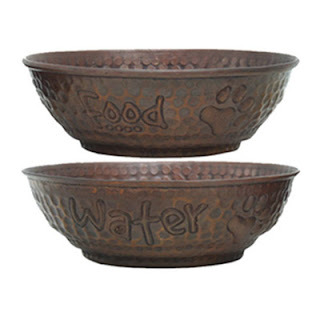 One of these needs is a pet bowl, but it is understandable that you don't want plastic or cheap metal lying around your house and that is why all of our pet bowls are made out of high quality copper so when you purchase from us, you know you are purchasing from someone who has quality at their first and foremost priority. Another thing you should know about our copper pet bowls is that they come in a range of designs and the colors are natural and full of tone so you can always expect a top result while also giving your pets the luxury treatment. Our copper pet bowls are manufactured to the highest standard and they look great in just about any family home. You will also find that they are available in bevelled and hammered alternatives and you can even get "food" and "water" printed onto them as well so you will never get them mixed up. With so many designs to choose from and high quality products that last and last, it really is no wonder that our customers come to us first when they need a durable pet bowl. So now you know why you should purchase from us, why not take a look for yourself to see what we have available? We are confident that we will have what you need and we are always happy to talk to you about your requirements.